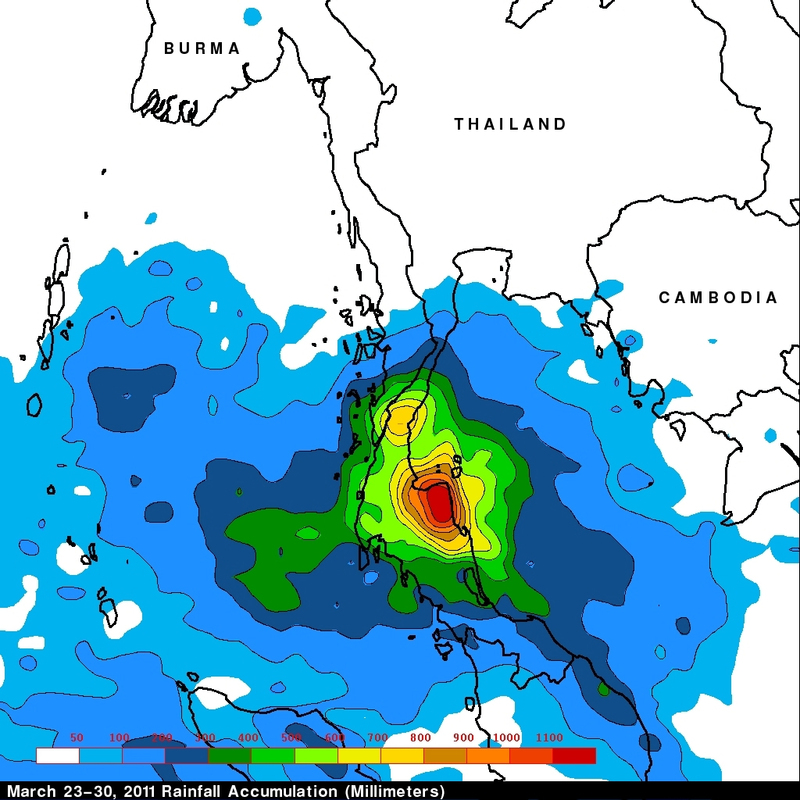 Data from NASA’s Tropical Rainfall Measuring Mission or TRMM satellite was used to create a rainfall map of the severe rains that fell in Thailand recently. More than 20 people have been killed in southern Thailand over the past week due to flooding and mudslides caused by extremely heavy rainfall. TRMM is a satellite managed by both NASA and the Japanese Space Agency, JAXA. It is a unique satellite because its advanced technology enables it to measure rainfall from space. A Multi-satellite Precipitation Analysis (TMPA) analysis was made using data that were calibrated with TRMM precipitation data. These data are calculated and stored at NASA’s Goddard Space Flight Center in Greenbelt, Md. and are available within a few hours after being received by satellites. The analysis showed that rainfall for the past week over the Malay Peninsula was particularly extreme with totals of almost 1200 mm (~47 inches). TRMM satellite data revealed that rainfall in that area was frequently falling at a rate of over 50 mm/hr (~2 inches). According to reports from CNN, since March 26 the southern province of Surat Thani received 855 mm (34 inches) of rain. Normally, the province receives about 2 inches of rainfall over the entire month of March. Heavy rain amounts (from satellite data) and flood inundation calculations (from a hydrological models) are updated every three hours globally with the results shown on the “Global Flood and Landslide Monitoring” TRMM web site pages, at http://trmm.gsfc.nasa.gov/. Hal Pierce SSAI/NASA’s Goddard Space Flight Center, Greenbelt, Md.